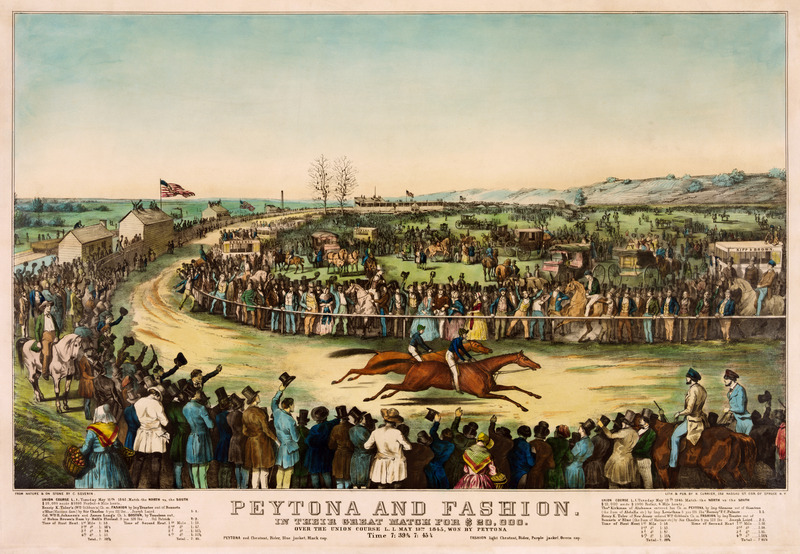 Early Horse Racing in Washington — the Washington City Race Course | Park View, D.C.
Print showing 1845 horse race at Union Course. Long before the area that would become the Columbia Heights neighborhood was subdivided and developed, it was among the early places for outdoor entertainment in Washington. This was due to the Washington City Race Course, often simply referred to as Holmead’s as it was located on the Holmead family estate. This race course was one of the earliest and best known race tracks, not only in Washington but also in the country. The track was laid out in 1802 by Col. John Tayloe, Gen. John P. Van Ness, Dr. William Thornton, G.W. P. Custis, John D. Threlkeld of Georgetown and George Calvert of Bladensburg. This popular race course was used until the 1840s, and was described as a mile track being laid out in a perfect circle with its center near today’s intersection of Fourteenth and Kenyon streets. The race track grounds extended from Tenth to Sixteenth streets. The track’s main entrance was centered where Fourteenth Street meets Columbia Road (then Taylor’s Lane Road). Spectators viewed the races from inside the track, entering mainly from the south. The race course was the arena of some of the more renowned horse races of the day, drawing crowds that included several Presidents from Jefferson to Van Buren – John Quincy Adams was observed to have walked to the race track from the White House and Andrew Jackson was described as the President with the liveliest interest in the races. One of the best known races at the National Race Course – and leading to the race of the century – occurred “in 1822 when a braggart plantation owner recklessly dared the owners of Eclipse to race against Sir Charles, the fastest horse in Virginia, at the National Course in Washington. Before a mostly Southern crowd, Sir Charles pulled up lame a half mile before the finish line, as packs of visiting New Yorkers hurled taunts and insults at the stunned Southern fans.” This lead to a challenge for a North-South rematch which eventually occurred on May 27, 1823, at the Union Course in Jamaica, N.Y. between Eclipse, the undefeated pride of the North, and a rising star from the South, Sir Henry. It was a race pitting North against South. At the time, horses raced in heats, with the first to win two heats declared the winner. In each heat, Eclipse and Sir Henry would race four miles, rest for a half-hour and go right back to the racing oval for a second race, and then a third. Eclipse again prevailed after winning the second and third heats. Some idea of what going to the races was like in the early days, and its impact on Washington, is conveyed in the following letter written by a member of Congress and dated November 8, 1803 (reprinted in the Evening Star on August 9, 1936). The horse races for the season have begun this day within the Territory of Columbia, and I have been on the turf to behold the great and fashionable exhibition. The ground on which the coursers try their speed is about 4 miles from the Capitol Hill. For several weeks this time has been anticipated with great expectation. People from far and near throng to behold the spectacle. Particularly from the adjacent States of Virginia and Maryland a multitude of spectators were assembled. The races, though beginning today (Tuesday), are to continue until Saturday. So keen was the relish for the sport that there was a serious wish of a number of the members to adjourn Congress for a few days. Having worked so faithfully on the Louisiana business, they said it was high time to rest a little. The Senate actually did adjourn for three days, not on account of the races, you will observe, but merely to admit a mason to plaster the ceiling of their chamber, which had fallen down a few days before. The House of Representatives met and adjourned; but you must not suppose this was done to allow the honorable gentlemen to show themselves on the race ground; you are rather to imagine that no business was in a due state of preparation to be acted upon. And so, there being nothing to do, these gentlemen went to the place where the entertainment was to be held, to while away the morning and enjoyed a few hours’ pastime. My morning’s work having been dispatched, I went to the place of rendezvous. Gen. Baily, Judge Verplanck and Mr. Hausbrouck rode in the coach with me. Not only the gentle and the simple were there, but almost all the great folk, including officers of Government. There were a great number of ladies, who mostly sat in the carriages which brought them. Several of the reverend clergy, too, were at this exhibition of the speed of horses. Kennedy, George. “Mount Pleasant, Founded by New Englanders, Has Interesting, Well-Kept History,” The Evening Star, November 20, 1950, p. B-1. “Old-Time Sport,” The Evening Star. March 8, 1901, p. 3. Proctor, John Clagett. “Fine Horses Once Gave Distinction to Capital,” The Evening Star. March 31, 1935, Pt. 2, p. F-2. Proctor, John Clagett. “Nation to Review Past At Noted Baptist’s Centennial,” The Evening Star. August 9, 1936, Pt. 2, p. F-2. Proctor, John Clagett. “Presidents Were Enthusiasts in Early District Sport Racing,” The Evening Star. February 23, 1941, Pt. 2, p. C-4. “Roadside Sketches,” The Evening Star. September 5, 1891, p. 13. Stephen R. McKevitt, “The Washington City Race Course,” in Meridian Hill: A History. (Charleston, SC: History Press, 2014), p. 122. This entry was posted on September 23, 2014 at 7:01 am and is filed under History, Sports leisure and entertainment. You can subscribe via RSS 2.0 feed to this post's comments.